← Remember the original spontaneous Holy Spirit of life? I’ve learned writing Christian fiction requires special care. This is especially true for fantasy. Creating transformational books demands Holy Spirit involvement. After spending well over thirty years on book one, I’m beginning book two. I didn’t start writing professionally until 1994. And, I started working on a Christian fantasy in the 1980s. But I didn’t have a clue about how to do that or what it would take. I knew I could write, whatever that meant, because when I went to college after getting discharged from the Air Force I was forced to take remedial English (having failed that at the University of Chicago in 1961). In 1968, my English professor passed me out a few weeks into the course after telling me that I didn’t need the course because I was writing well enough to easily pass remedial English. Writing for a large textbook publisher, I was given at least four editors for various aspects of the new book. Each of them radically changed my writing for the better or the worse. After six textbooks in the next seven years, I learned a lot. But little of that helped my efforts at fiction. I kept picking at the fantasy but developing a plot, characters, and all of that were clearly beyond me in retrospect. I began to seriously confront the concept that writing Christian fiction requires special care with my first fiction to be released. The Righteous Perish was a good story. Thankfully, it was an end times novel and I had been teaching that enough to know my subject well. However, it took a lot of work and four releases before I was ready to move to the next idea. I had no idea what special care was required. The plot of Daniel’s Mighty Men (no longer in print) was extremely complex. The character count was huge. After all, this was an invasion of the US by an army of a drug cartel head backed by strong Chinese involvement enabled by traitors in the US military leadership and members of the US President’s cabinet. It was triggered by a real and ancient Mayan belief in Aztlan which added another whole layer. Plus my general purpose was to show how strong warriors might work if they were Spirit-filled and sold out to Jesus. The reviews were good. But no one wanted to take on a book this large in this day and age. It’s presently released as a three book series Invasion, Evulsion, & Ejection [Tales of Mighty Men] (though the lead character is female, and there are many strong female characters). But the changes to make that work greatly lessened the impact. Sales have been minuscule. Here’s where I began to see that writing Christian fiction requires special care to make things work. I discovered I needed to start with a plot, not develop it as I wrote the book [even though that was extremely enjoyable]. I even tried an outline—in sheer desperation. But that was work and tedious—hopefully, that wasn’t necessary. World building (maps, gazetteer, spiritual reality, magic, customs, language, and so on) provide the key to a believable, comfortable place to live and work. It takes a lot of time to do well. The suspension of disbelief by the reader is crucial. Yet, for the book to be redemptive and transformational I needed daily, direct involvement from the Lord. Reading fantasy is very important to this process. Your background matters. For example, I find authors with role-playing experience can assume things which non-role-players have a hard time comprehending [or agreeing with]. Writing Chrisitan fantasy demands a lot of experience in reading and in living. The spiritual part demands the most. It’s relatively easy to toss off a novel which is entertaining. That’s almost formulaic. The difficulty reveals itself when making a fantasy “real” enough to engage deep reader involvement. Beyond that, you cannot write spiritual content you are not living and expect transformational results in your readers. 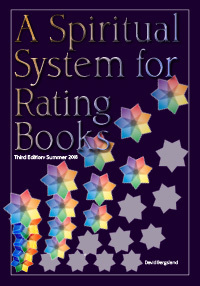 This is why I wrote A Spiritual System for Rating Books now in its third edition. If you define Christian fiction, you are dealing with several basic facts. First, without Jesus or a sacrificial savior, it cannot be Christian. Second, it cannot be redemptive without believers experiencing the birth from above and the resulting new creation. Third, it will have no power to transform lives without showing a direct personal relationship with the savior and the constant involvement of the Holy Spirit. Here I’m talking to Christian authors, only. We are different from the heathen (non-Christian) authors. Not only are our criteria different, but our process is very different from non-believing writers. This is a serious ministry done in obedience. If it’s not, you’re writing out of your flesh. Scripture is clear, the world and the flesh are at war with the Holy Spirit. We write in service to our Lord, dependent upon His wisdom, guidance, and anointing. You may think I am overstating this. I can understand that, but the results will be limited spiritually unless you show characters living realistic transformed lives. Actually, I am quietly stating the truth—biblically and experientially. 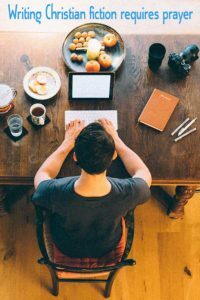 I’m not negating practice, studying, experience, beta readers, editors, formatting, readers, reviewers, or any of the rest of the normal book production process. We are required to learn our craft. But the work is a ministry of the Kingdom of God for His purposes, following His lead. You should always ask the Lord if He wants you to include that idea in your new book. If you want your book to be transformational, to go beyond entertainment, to change the lives of your readers, you must have content which the Holy Spirit can use. That does not come by accident unless it is a creative burst which the Lord confirms in your spirit. Yes, in His image we are creative. But we must check with Him to see if it’s helpful. A lot of creativity these days is only mental self-gratification—people pleasing themselves. In my fine art classes in college, I was taught that for an artist good is what I like. Though I knew that to be a lie as soon as I was born again, it took decades to completely clean up that stronghold. Truth is found in Jesus by His Holy Spirit. It comes no other way. That’s why Jesus taught in parables. You only confuse your readers with Truth unless you are directly led by the Lord in your writing. Yes, writing Christian fiction requires special care which begins with prayer, and ends with it also. I find that praying in the Spirit while writing causes huge differences in the results. But that requires direct intentional effort on your part as a Christian writer. This remains true even if the Lord calls you to produce clean reads. But always remember, a clean read is not often Christian. In fact, books which show a character’s direct involvement with and obedience to a Messiah are extremely rare—in any genre, any novel. The more you allow His involvement, the more powerful your book will be. Talk to Him about these things. Then let what he tells you to do transform your writing. Pray for me also. I’m certainly not very good at this—yet.